Nature thrives where you least expect it—in abandoned yards and overgrown ditches and in-between cracks in pavements. So do not be surprised if you find a variety of edible plants growing in the city, some wild and others that have escaped from gardens or trash. Some of these weeds are rich in nutrients and you would do well by adding those to your salad mix. Of course, one should not eat all that are edible. Herbs with medicinal properties cannot be called food. Soil toxicity should be considered while selecting foraging sites. But there are plants that can be a source of seasonal dishes and add diversity to your food if you learn to identify them. The older generation, who had a closer relation with their food, is aware of the culinary use and health benefits of these greens. When the city was a town and there were open spaces, every home had a small garden. I was lucky to grow up in an institutional campus in Delhi where my father kept a kitchen garden. Along with vegetables, he would grow wild greens that are today looked down upon as weeds. Wild amaranth (a species of Amaranthus), wild purslane (Portulaca oleracea) and several other ubiquitous weeds were regularly cooked in our kitchen. They still are. Earlier this year, a socio-cultural move- ment called Delhi, I Love You organised an urban foraging walk in the Lodhi Gardens to make people aware of wild edibles. It was a guided experience followed by a tasting of the foraged harvest. Of late, the concept has caught the fancy of celebrity chefs world- wide. Alas, field guides for identifying wild edible plants in Indian cities are yet to be written. The internet-savvy among us can, however, access a collaborative map of urban locations on fallingfruit.org where one can forage for food. Of course, very few people from India have joined the portal so far. So go out and scour your neighbourhood to find some interesting plants to eat. While urban foraging is not going to mitigate hunger, it can surely bring diversity to our food basket and get us closer to nature. One such easy-to-identify delicious green is common mallow (Malva sylvestris). I first spotted a giant patch of it in a ditch inside Delhi’s Purana Quila. Known as sanna bindige gida in Kannada, gurchanti in Hindi and sotchal in Kashmiri, the com mon mallow can be found all over the world. It is happy to take over areas where soil has been disturbed. It can be found in vacant lots, by roadsides or cultivated fields, in clay or loam, and in full sun or partial shade. It is tolerant to drought and is recognised as an important famine crop. Almost all parts of the common mallow are eaten and its culinary use has been known for over 3,000 years. It has also enjoyed the reputation of being a cure-all throughout history. Roman naturalist Pliny the Elder, in his first century encyclopaedia Natural History, recommends daily consumption of mallow juice to prevent illnesses. It was widely believed “to sooth whatever ails you” in the 16th century Europe, and was a popular vegetable in pre-Han dynasty China. Native Americans use it to treat sore throat and tonsillitis, and to facilitate labour. Modern research has identified what makes mallow a panacea of sorts. The plant is loaded with polysaccharides that help improve the immune system and antioxi dants which delay cell damage. Its leaves are a good source of vitamins A, B1, B2, C and E as well as calcium, magnesium, potassium, iron, zinc and selenium. All these make the plant beneficial for pregnant and lactating women. 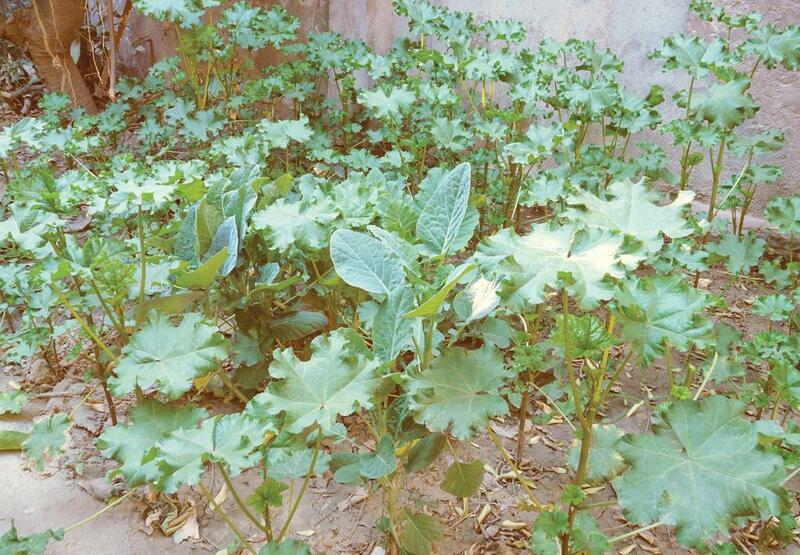 In fact, this association might be the reason common mallow is regarded as a vegetable for women in Kashmir, and men admit to liking it only in private. Studies have also established its efficacy in reducing cholesterol and triglyceride levels, while its antioxidant, anti-inflammatory and anti- cancer properties are being explored. Commission E, the advisory board in Germany that evaluates herbs for medical prescription, approves mallow for treating irritation of oral and pharynx as well as for dry cough. French and Swiss pharmaco poeias note the efficacy of its flowers and immature fruits for treating whooping cough. In India, folk and Unani medicines recommend mallow for treating skin disorders and injuries, particularly lesions of the mouth and stomach ulcers. In India, its culinary use seems restricted to Kashmir, but it is popular in Eastern Mediterranean and Arabic cuisines. In Turkey and Greece mallow leaves are used to make dolmades, an appetiser that is typically stuffed with rice and meat. In Israel, where the green is experiencing a resurgence of sorts, it is sautéed in olive oil with chopped onions to make a warm salad. Mallow leaves can be eaten raw and added to smoothies or salads. Pare the leaves off the stalk. Keep the leaves whole and chop up the tender stalks. Rinse well and drain. Heat oil in a wok or a heavy bottomed pan. 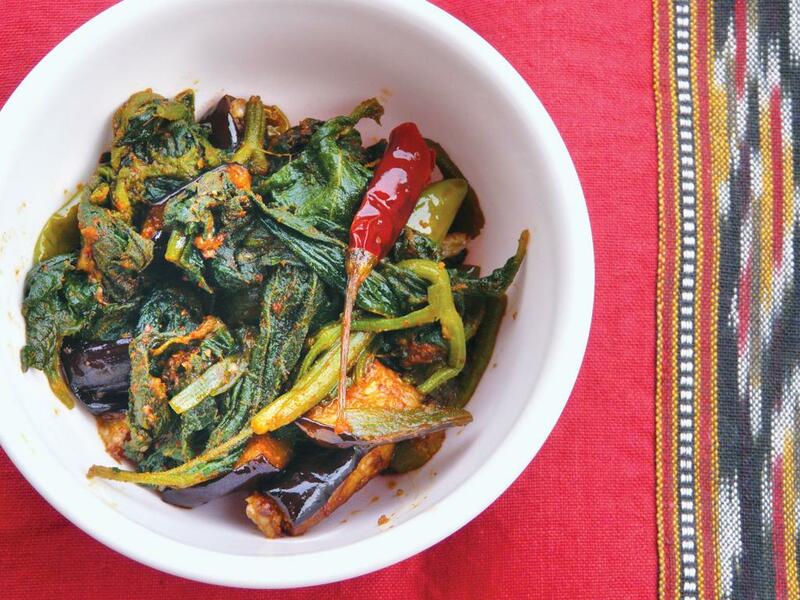 Fry chopped brinjal in hot oil till they turn golden. Remove with a slotted spoon and keep aside. 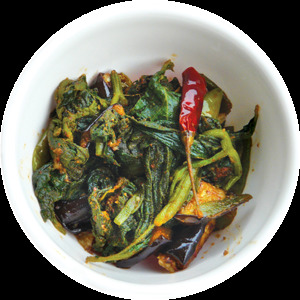 Add a generous pinch of asafoetida to the remaining hot oil, and then the leaves, chopped stalks and red chillies. Stir. Add the remaining ingredients and mix well. Cover and cook on a medium flame for five minutes. Remove the lid and cook for another five minutes, stirring occasionally. Add the brinjal and stir gently. Cook for a few minutes till the stalks are tender, but not mushy. Serve with steamed rice. The story has been taken from the 16-31 October, 2016 issue of Down To Earth magazine.